Please can you give an overview of your research into the impact of neural stem cell transplants in experimental central nervous system (CNS) disorders? Demonstrated a completely novel mechanism of stem cell-to-immune system communication that works via the horizontal exchange of functional IFN-g/Ifngr1 complexes delivered via stem cell exosomes. What are the three main ways stem cell grafts interact with the autoimmune system? What we know is that stem cell grafts can be either (1) immunogenic (e.g. activate host immune responses often culminating with the rejection of the graft; this is the case for all or xeno transplants), immune modulatory (e.g. promoting the generation of subsets of immune cells with regulatory capacities such as Treg cells), or even immune suppressive/anti-proliferative. What is neural stem cell pathotropism? Pathotropism is a concept that can be applied to stem cell grafts in general, not just neural stem cells. It is generally described as the intrinsic, but also environment-reactive, capacity of the grafted stem cells to sense the dysfunctional/pathologic environment and to activate a number of key behavioral responses to extracellular ligand molecules coming from the dysfunctional environment that include cytokines, chemokines, growth factors, neurotransmitters, etc. What percentage of transplanted neural stem/precursor cells (NPCs) survive in vivo and why? In our experience we observe a general survival of 3-8% of grafted neural stem cells, which persist over time. Our data have been confirmed by several independent studies with stem cells other than neural stem cells (e.g. mesenchymal stem cell) in the same animal disease models of us, as well as with neural stem cells in different animal disease models. Can you describe the new anatomical entity you observed after transplanting neural stem cells into mice with a model of multiple sclerosis (MS)? How did you confirm this wasn’t an artefact caused by injecting stem cells through biological fluids? What we and others observe following the systemic injection of stem cells is the formation of what we have named ‘atypical ectopic perivascular stem cell niches’ – these are discrete perivascular areas where grafted stem cells are found, persist over time, and establish contacts and likely exchange information with host immune cells – both tissue resident [recruited locally] and tissue infiltrating. We have challenged our initial observation by injecting stem cells locally, at the level of injury site in a rodent model of severe spinal cord contusion injury, and indeed proven that stem cells possess intrinsic homeostatic properties that make them capable of creating the cellular and molecular conditions to create ‘atypical ectopic perivascular stem cell niches’ also after injection routes that avoid the systemic circulation. What were your main findings of this research and were you surprised by what you observed? As above, the main findings of our research were the observation of homeostatic functions by a cell technology that was expected to work by cell differentiation and integration into the host tissue. Of course this was a big surprise for us, and we have been struggling more than a bit to convince some skeptical leaders in the field. The process (of education) is not completed yet. What are the main strengths and limitations of NSC therapies in CNS diseases? Stem cells are a real promise in regenerative medicine, and several exploratory human clinical trials are taking the responsibility (and risk) of showing how feasible and how much of this promise is associated to correction of dysfunction. "How stem cells speak with immune cells"
Safety of stem cell therapies is indeed a first step, but with no reservation everyone is eager to know whether human stem cell therapies will ever be as efficacious as pre-clinical data have consistently shown. In the case of somatic neural stem cell therapies one of the present limitations is indeed the starting source of material, which is in most of the cases collected out of therapeutic abortions and then extensively expanded/manipulated in vitro, prior to transplantation. This platform leads to single donor stem cell therapeutics, which are generally also allogeneic in nature and then require low dose chronic immune suppression to be administered to treated cases. There is yet not much understanding whether this combined chronic immune suppression might interfere with any of the mechanisms and effects anticipated by late pre-clinical work, and ultimately on the safety and efficacy outcomes expected by these early clinical trials. How are the advances in cellular reprogramming and direct cell conversion being applied to regenerative medicine? Cell reprogramming may realistically help, when proposing stem cells within the exciting and highly innovative concept of personalized next gene molecular medicine. Optimizing the newest technologies one can think to reprogram accessible cellular sources into patient-specific and tissue-specific stably expandable stem cells for autologous treatments. The idea is there around, but some more technology refinement and in vitro/in vivo validation work in animal disease models is required. How is the stem cell field progressing? In addition to the understanding of fundamental principles of stem cell biology, the progression of the stem cell field is basically twofold, one direction leads to stem cell therapies for regenerative medicine with all the different flavors that we can imagine, from cell replacement strategies to stem cell-mediated immune modulation, to finally combination of grafted stem cells with smart compatible materials. Another direction is of course that of applying cell reprogramming to the generation of patient-specific stem cell lines to be used in vitro for drug/small molecule screenings. Why are you devoting special attention to the modalities by which NPCs engage programs of horizontal cell-to-cell communication with cells in the microenvironment? We have a strong belief that understanding the mechanisms regulating the communication (signaling) between the stem cell graft and the host immune system will pave the way for the development of safer and more efficacious therapeutic approaches, or provide significant inspiration for the development of alternative molecular approaches in neuroscience. 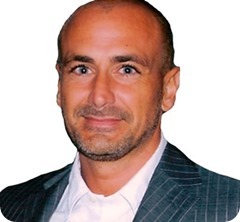 After receiving his MD (1995) and PhD in Neuroscience (2004) from the University of Siena (Italy), Stefano completed a residency program in Neurology at the same University (1999) and received additional training at the Brain Repair Centre, Cambridge University, UK (1996-1998).​ He then completed two Post doctoral fellowships (2004-2005) with Gianvito Martino at the San Raffaele Scientific Institute, Milan (Italy), where he progressed to the position of Project and the Group leader (2005-2010). Stefano is an University Lecturer and Honorary Consultant in Neurology at the University of Cambridge, UK, within the Centre for Brain Repair (2010-). He is also an European Research Council (ERC) Starting Independent Researcher and member of the Department of Clinical Neurosciences. Current projects in the PluchinoLab are exploring the cellular and molecular mechanisms regulating the therapeutic plasticity of neural stem cells in complex CNS diseases such as multiple sclerosis, spinal cord/brain injuries and stroke. While keeping an eye on next generation stem cells, either induced pluripotent stem (iPS) or induced neural stem (iNS) cells that are being tested via classical experimental cell therapy approaches, we are also devoting special attention to the study of the different modalities by which stem cells signal to the brain and the immune system (neuro/immune interactions). For Beckman Coulter’s worldwide office locations and phone numbers, please visit "Contact Us" at www.beckmancoulter.com. In Act I, Wallace’s desire to automate the routine erythrocyte count led to a simple idea, the definition of the Coulter Principle, its patenting, its acceptance by the National Institutes of Health, and its description at a national conference. In Act III, a broad research effort developed regarding volumetric errors originating in functional characteristics of the sensing aperture, and the brothers’ growing organization found solutions permitting introduction of increasingly automated hematology analyzers. Today the industry thrives, with several participants.